If you are like me and consider safety being paramount, read this carefully. There are a lot of boats offered for charter on the market with more or less experienced skippers. But only a very few of these fulfil the stringent rules for safety. Many follow the standard recommendations of the corresponding home country of the owner for private leisure crafts or they sail under “racing rules”. In commercial shipping, The UK Ship Register has become 1 of only around 20 in the world to keep the United States Coast Guard (USCG) award for excellence. 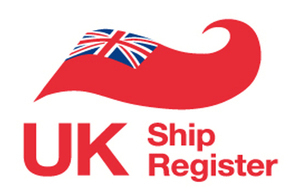 Not so, if you choose to register your vessel in the commercial ship’s registry of, for instance, the UK! Heavy tradition and nautical history spread their wings over Regina Laska, when joining one of the oldest registrations for commercial ships in the world, dating back from from the 16th century! As soon as you charge money to join, the boat comes under completely different set of rules, resembling of rules for ferries and cruise ships. I am very proud of the safety standards of Regina Laska! Proudly flying the UK red ensign showing that Regina Laska is under the stringent rules of a proper ship’s register for commercial sailing and coded by the MCA. Regina Laska is surveyed by the MCA following the stringent MGN-280 rules for Area-1 offshore sailing. It’s like the ISO-Quality in boating or the TÜV/MOT for cars. The outcome of my inspection in 2018. 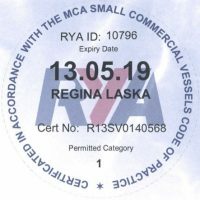 Regina Laska is checked annually by two different authorities (MCA and RYA). The extremely high standards of safety must be fulfilled for offshore sailing at all times. Charter guests do not notice the rigorous safety measures (and don’t need to think about it either) but might find it re-assuring that the safety standard of Regina Laska is very far reaching and not comparable with most other bare boat charter companies. Every hatch, every pipe, every air ventilation system, every cable follows the stringent rules of the MCA area 1. Despite Regina Laska being lifted every winter anyhow, undergoing her annual thorough refits, the boat needs to be lifted for the MCA at regular intervals to be checked also under her waterline. In 2018 it was time again, so I asked the best and most knowledgable surveyor I know for Hallberg-Rassy boats, namely Julian Smith from Hamble Marine Surveys. Julian is, by the way, also a very good address, if you are planning to buy a use HR and wish to have an official survey done. Julian going through the entire hull looking for sound differences that could be tell-tales of a faulty hull. Julian checked Regina Laska in every detail, looking for delaminations, the state of the through-hulls, the rudder shaft, the cutlass bearing etc. He is especially critical to through-hulls in brass and says they have a planned-for service life of no more than five years. They might hold longer, but how do you know? With brass you know and therefore he would strongly advise any safety-oriented boat owner to to change his through hulls if they are older than 5 years to either bronze or composite, e.g. from True Design. Even on Hallberg-Rassy’s that have not changed their through-hulls, he is not happy with them if they are older than 5 years. Of course, mine are of bronze and will be good for at least 10 years. The rig has to be inspected every 5 years with a rig inspection report and he was very pleased that I have my rigg checked every or every second year with adequate paperwork. Ever 10 years I change my rigging on Regina Laska. Julian was especially impressed by how beautifully carbon was spliced into Dynema on my rigg. The credit goes to my rigger Daniel Engström at Spinsail back in Sweden. 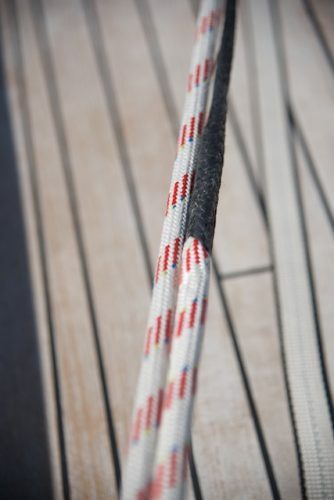 Carbon spliced into Dynema on Regina Laska, made by Daniel Engström at Spinsail, Sweden. 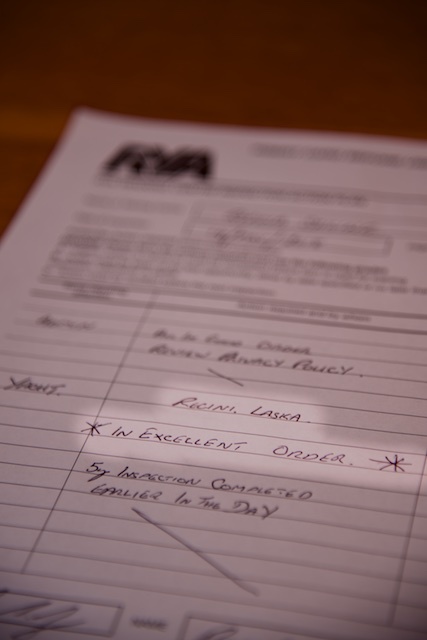 Regina Laska is, however, not only inspected annually by the MCA for Offshore Sailing (area-1), but also by the RYA. The RYA is partly looking at similar issues regarding the safety of the boat, but is also checking how guests live, are treated, if there are complaint possibilities, data protection, tidiness and, obviously, the skipper’s proficiency regarding his own health, his medical training, his up-to-date Yachtmaster Instructor abilities etc. They look at environmental issues and teaching facilities. 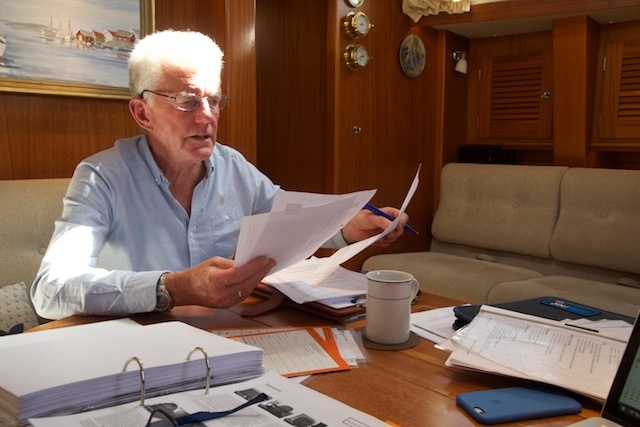 My RYA inspector Roger Seymour inspecting my paperwork before going through the boat in great detail. He also gives tips about new developments within the RYA and what is important to the RYA. The medical kit onboard is far-reaching and surpasses the stringent rules of MSN1768 by far. I even cary an oxygen generator. 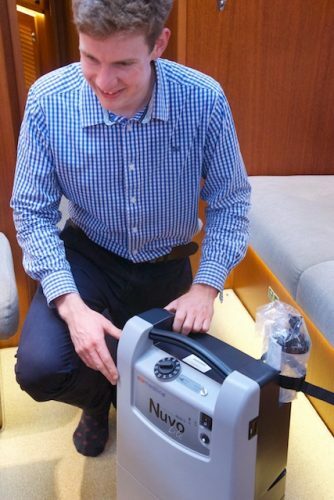 The new oxygen generator is demonstrated by Ben from my medical supplier MSOS. I have long been thinking of also adding a Defib onboard. For this reason, I studied a Research Paper from the USCC spanning 11 years of data, ranging from 2000 to 2011. Checking the statistics, it says that only two persons (1.4% of the cases) died because of cardiac arrest on a motorised sailboat (i.e. no dinghy). Question is, if these two could have been saved if they had a Defib at hand? We are talking about 2 cases in the entire USA during 11 years. In one year alone (2011) the USCC estimated that there werer 16.9 Mio sailing person-days in US waters. For the period, 229 Mio sailor person-days were assumed for the study during the 10 years. So: 2 dead on motorised sailing boats plus 4 dead on nonmotorised sailing boats (dinghies) died in cardiac arrest during 229 Mio sailor person-days. The risk is thus 6/229Mio = 3 x 10-5 cardiac arrests per 1000 person sailing days or 0.03 cardiac arrests per million sailing days. Sounds as safe as flying to me….? So, the Defib has suddenly gone down on my priority list. They do have a good reason to exist in shopping malls etc where an ambulance can be present within minutes and where also many elderly people might be, but on an offshore sailing boat, I have, so far, decided against it. The oxygen generator makes much more sense, and thus I carry one onboard, just to be on the safe side. 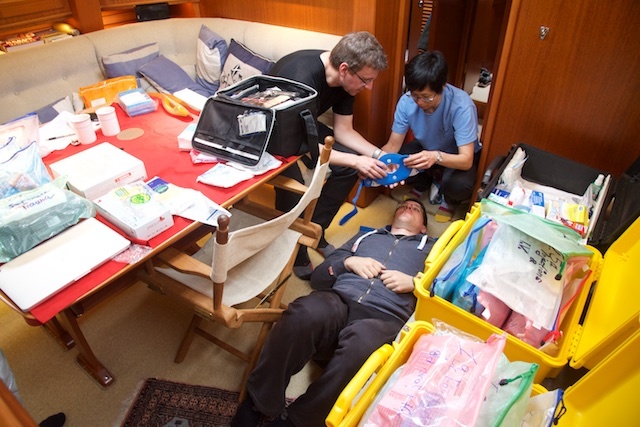 Guests who have participated in my Medical Training Courses appreciate to check the equipment and do some onboard medical training as part of their Yachtmaster Training. Checking my medical equipment during one of the Yachtmaster Trainings. To sum up, one can say, the MCA looks after safety, the RYA looks after comfort and I personally look after style! – All nine high-end automatically inflatable Spinlock life wests with 3 lights (of which one SOLAS approved), spray-caps and AIS emergency position beacons (PLB’s) are tested and repacked annually by a professional survey station. – Thermal Protective Aids (TPAs) are available for all onboard. – The life raft is inflated, repacked and checked annually (and not every 4 or so years as stated by the manufacturers). The life raft is not a standard ISO or ISAF-raft, but follows the strict rules of SOLAS-A (Safety of Lives at Sea), similar to the rafts used by ferries, cruise ships etc. – All fire extinguishers onboard (7 in total plus fire pump und fire buckets) are surveyed annually by a professional fire expert. – The propane gas system is completely new since 2013 and essential parts replaced again in 2017 and is surveyed annually by a gas expert. The installed gas alarm does not only given an alarm sound, but also automatically shuts of the gas at the bottle, which is stored in a ventilated deck storage. – There are 5 bilge pumps onboard: One running on 230V, two on 24V, one on the 12V emergency power system and one manually operated high capacity pump. – The engine room is fully fire proof, has its own fixed CO2 extinguishing system and dedicated fire-alarm. 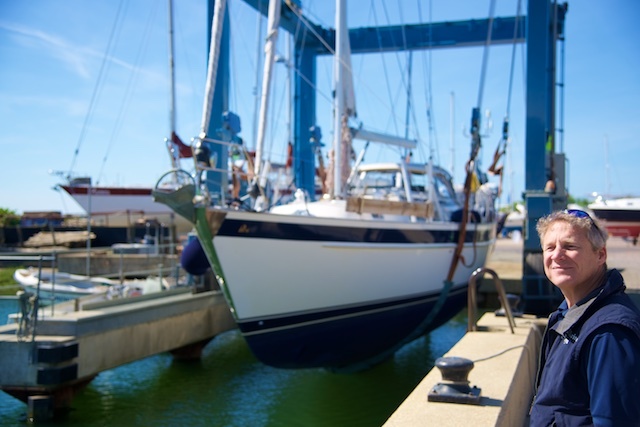 – The entire boat has undergone a rigorous individual stability test and carries a Stability Booklet proving its seaworthiness under all conditions of loading and wind forces. A Freeboard Mark is existent. – Regina Laska has three individual electrical power systems (24V, 12V and 230V) whereby one solely dedicated as emergency power system for essential lighting, navigation and communication (12V). The main batteries are of the modern Li-Fe type (new 2018) and will always offer ample power. – There are three independent heating systems onboard, two by Webasto and one by Ebersprecher. – The operation is supported by an extensive documentation, such as a Training Manual, an Instruction Manual, a Defect Booklet, an Accident Reporting Routine and numerous Safety Checklists and Nautical Publications. These are all annually checked by the classification society. – There are several sophisticated MOB-systems onboard, e.g. the Jonbuoy Recovery System by Ocean Safety (new 2018), fixed horseshoe buoys and Danbuoys with light as well as a SwedeBuoy Recovery system. – There are three anchors onboard: A 33kg Rocna with 80m stainless steel stress-tested chain, plus a Fortress FX85 (also used as the main anchor by the US coast guard for its 87 feet/91 tonnes ships) as storm anchor plus a Bruce 15 kg kedge. – The navigation system is the latest Furuno-equipment and is redundant in all major aspects, e.g. with two plotter/PC systems, two autopilots, four fixed GPS’s plus two handheld ones (one in grab-bag and one stored protected against lighting). Further to the annually deviated main compass, there are three electronic heading sensors onboard (one satellite compass plus two electronic fluxgate compasses). In addition to the two redundant navigation systems, we use SeaPilot with official S-58 ENC charts, which is connected to the onboard navigation system via a Multiplexer. – Celestial navigation is used for fun and safety, should there be a lighting strike or a hacking into the GPS-system. – Further to 900 liters of water in the tank and emergency water bottles, Regina Laska has two watermakers: One 145L/h high capacity watermaker and one emergency hand-driven watermaker. Emergency food is also carried. – Each cabin has two exits, one through the door and one through an individual hatch. This is seldom found on production boats these days, unfortunately, where many cabins only have a window or a far too small hatch that could not be used as an exit in case of fire. 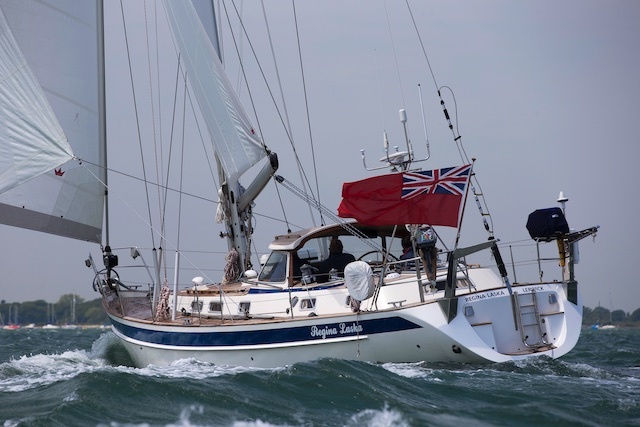 – The skipper has the qualification of an RYA Yachtmaster Ocean instructor (renewed and assessed every 5 years) and has sailed well over 60,000 miles and has years of experience in charter- and sail training. The above safety equipment are some examples to illustrate how Regina Laska is operated and how she differs from most boats used for bareboat or skippered charters or sail training vessels. They will hopefully never be used and hardly be noticed by most guests. It’s just a good feeling that safety is playing an equally important roll as on a cruise ship or ferry. Finally, please also note that your skipper, Leon Schulz, has the following qualifications and experience that are being assessed, updated and renewed regularly. Before joining a charter or sail training boat I would strongly recommend to require that the boat as well as the skipper’s qualifications follow the MCA or any other respected society and ask to see a certificate stating the area the boat is allowed to sail in – and not just under racing rules. And even if the boat fulfils national rules, it is good to compare these to the stringent MCA MGN-280 rules. The fact that a skipper as many years of experience or has sailed many miles is good, but would not be sufficient if the vessel is coded by the MCA, which has very stringent rules on the skipper’s regular assessments and examinations, keeping up with the commercial endorsement which is necessary if you skipper with paying crew. The fact that the boat would be insured for a wider area is not relevant, since an insurance helps little when the actual situation strikes.